A crowd has assembled beneath the porch of the church of St Ludwig as a religious procession passes by. This scene, which took place a few metres from Kandinsky’s apartment, was sketched by the artist in one of his notebooks of late 1908, accompanied by precise notes on colour. Kandinsky had been interested in Signac’s Pointillist technique since 1904, as can be seen in his paintings of “tales” painted between 1905 and 1907. The present work returns to those gem-like brushstrokes and dark backgrounds but deploys a vibrant, arbitrary palette derived from Matisse and the Fauve painters, whose work the artist had seen in Paris in 1906 and 1907. Kandinsky differs, however, from the French painters in the way that he establishes a marked contrast between the small patches of colour (many of them totally non-figurative) and the black background, giving the work an abstract-decorative quality. Ludwigskirche in Munich depicts the lower part of the street façade of the church of St Ludwig (built 1829-40), one of the most important works of the early 19th-century architect Friedrich von Gärtner (1792-1847). The church is located not far from Schwabing's Ainmillerstrasse, in the "artists' quarter" of Munich, where Kandinsky rented an apartment and studio in September 1908. The picture was probably painted during the autumn of that year. A preparatory pencil drawing, closely related to the final composition, occurs on page 61 of a small-format notebook in use during 1908-1909. It differs from the final painting only in the way the foreground figures are more clearly separated into groups, and in taking a more distant standpoint from the church, allowing us to see rather more of the right-hand part of the façade. The drawing also bears numerous colour indications: "red" and "rose pink" above the portico, "green" "violet" and "blue" beneath the arches, as well as several references to the treatment of the shadows. 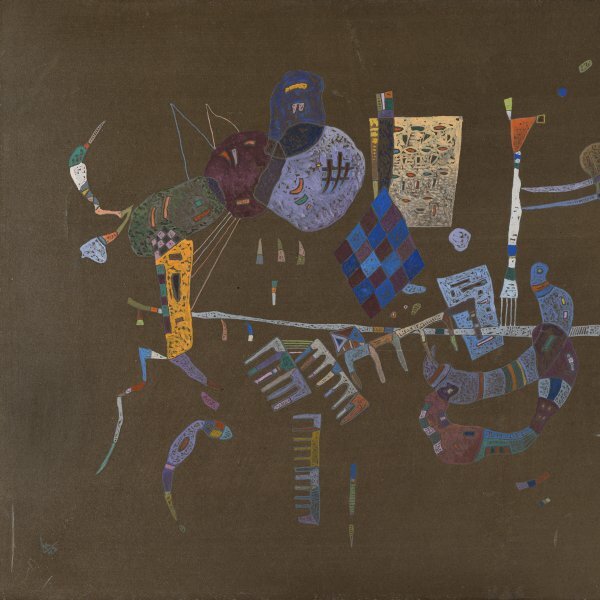 Evidently, the marked contrast of tonal values found in the painting was a matter of some importance to Kandinsky, and one he wished to establish clearly in his own mind before taking his brush in his hand. In the picture as actually executed, the porch is thronged with a brightly-coloured multitude, presumably worshippers. The banners beneath the central archway and the group of priests in their yellow vestments suggest they are taking part in a procession to mark one of the great feasts of the church. The application of paint and jewel-like colours recall Kandinsky's immediately preceding 'fairy-tale' paintings of the period 1906-1907, often depicting Russian scenes, which were done under the influence of French neo-Impressionism. 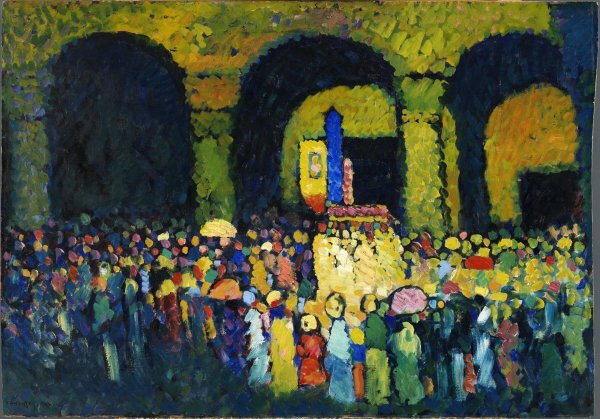 In his early years as a painter, Kandinsky was greatly interested in neo-Impressionist theory and practice. In his treatise On the Spiritual on Art (1911), he refers to Paul Signac's essay From Eugène Delacroix to Neo-Impressionism, the most important theoretical statement of the aims of neo-Impressionist painting; while as early as 1904 at the tenth exhibition of the "Phalanx" society in Munich, he had shown a group of modern French paintings which also included works by Signac and other neo-Impressionist artists. In Ludwigskirche in Munich, however, the brilliant sunshine casts the porch into deep shadow, giving the painting an abstract-decorative quality which is new in his work at this time. The handling of pigment and high tonal values also betray the impact of Matisse and the Fauve painters whom Kandinsky had the opportunity of studying in Paris in the course of his extended stay there during 1906-1907. The picture, like many of his early landscape studies and paintings in small format, is not entered in the artist's handlists. It has, however, always been accepted as authentic, including by Will Grohmann in the supplement to his oeuvre-catalogue of Kandinsky's paintings.